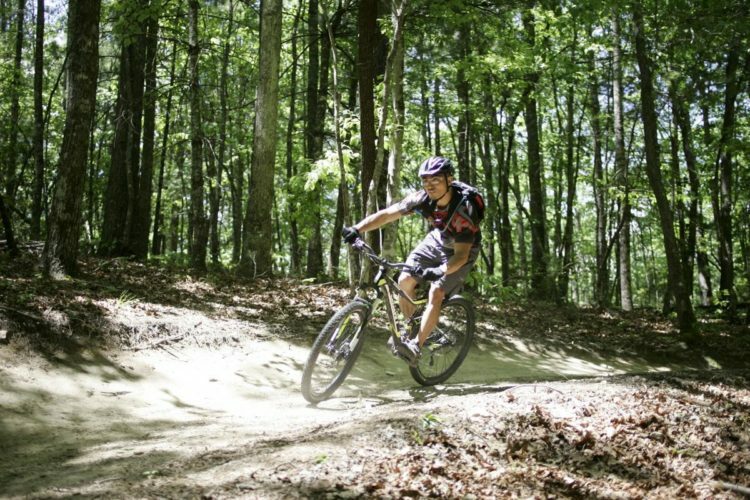 If you’ve ever ridden a mountain bike in western North Carolina, you’ve ridden Tsali, right? 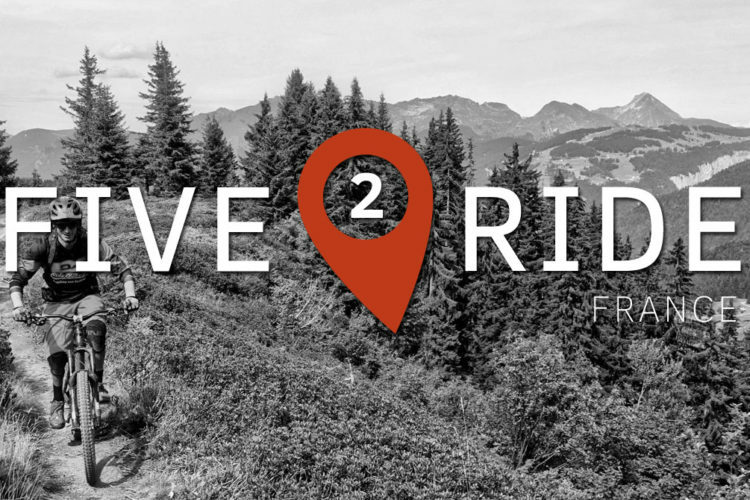 Stunning mountains, awesome rhododendron tunnels, sweet hops all over, and some gorgeous berms. Yeah, it’s an epic trail. And yet… sometimes I wish I could condense it, squeeze all the best parts of Tsali together, and add a big dash of speed. Well sometimes, wishes come true. 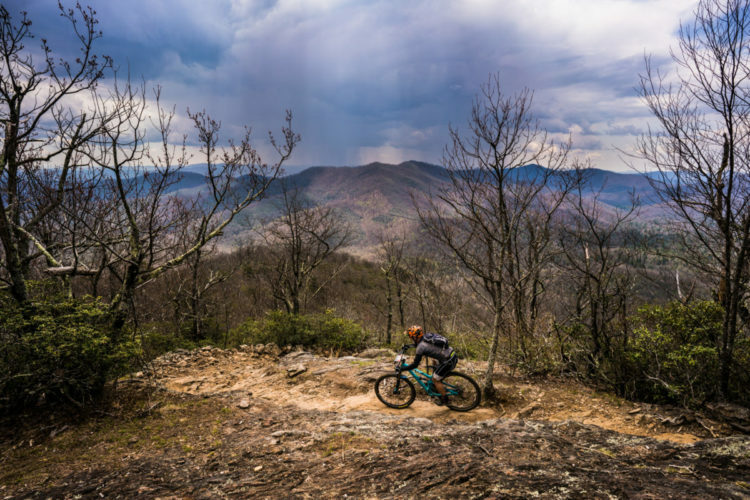 Welcome to Fire Mountain, a freshly-minted trail system created specifically for mountain bikers in the heart of the Qualla Boundary, the beautiful ancestral home of the Eastern Band of Cherokee Indians. A younger generation of Tribal leaders have been looking for new ways to expand the use of their stunning natural resources, and Fire Mountain is an early example of their successful vision. Imagine waist-high berms carving around more than 20 switchbacks in a single run. Imagine three of them back to back to back, like a crazy snowboard pitch. The flow is sooo smooth, so long, in places it feels more like whitewater than biking. Even the contour runs have a delicious flow to them, dipping down and then back up in between the tree boles, slinging you from one to the next. There are enough roots and rocky crossings to make you pay attention. But most of the time, you’re just cooking along a smooth dirt ribbon snaking through the trees. Throw in one badass sky bridge, and you have the makings of a professionally-crafted trail system. Then there are the jumps. Fire Mountain is brimming with water bars, tabletops, and other erosion breaks, and it seems every one of them begs you to break the bonds of gravity and fly for a while. There are just so many jumps, it’ll blow your freaking mind! 50? 80? I don’t know; I can never count ‘em all. Two- and three- foot rollers that you can just float over. Head-high tabletops that’ll give you as much air as you dare. Groovy little side-hops that land you up on a berm wall. And long, dark rhododendron tunnels where you have to duck your head when you leave the ground. 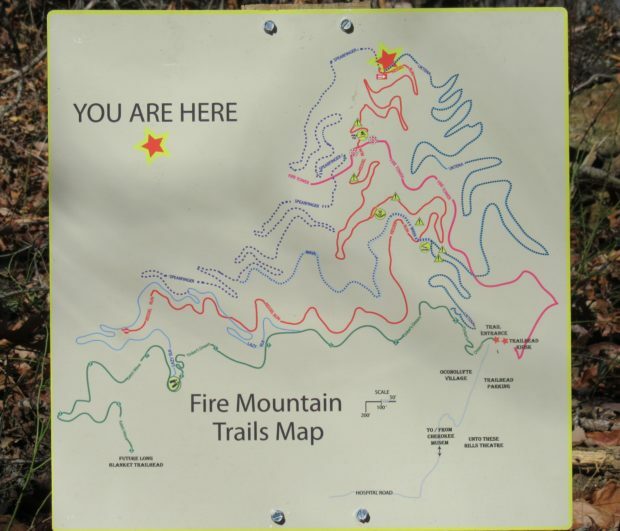 For now, Fire Mountain has two routes up, where all the trails meet, and three choices down, along with a couple of side connectors. It’s usually 30 minutes of climbing to the top, followed by 15 minutes of incredible roller coaster action back down. It’s an immense amount of fun for not too much work. And with the trailhead and parking lot right at the bottom, it’s easy to make a run, stop for a snack break, then head back up the mountain for a totally different descent. 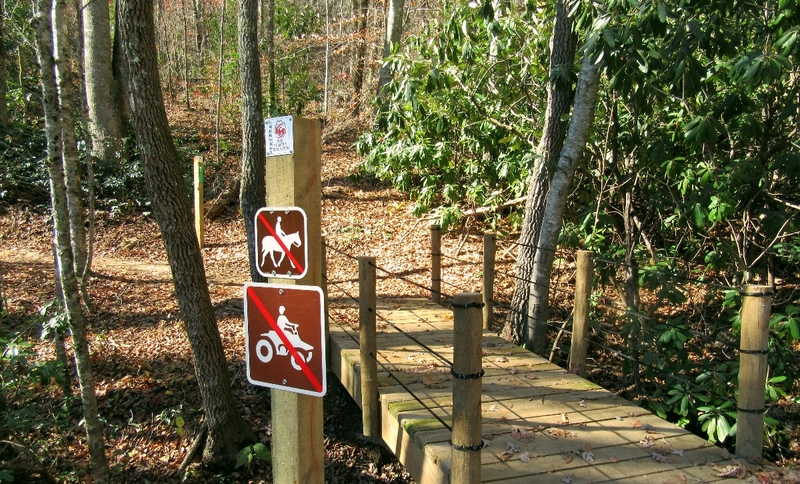 Many of the trails are named after figures from Cherokee legends. Uktena – the giant serpent of the woods – slithers down the mountain, jogging left and right through the rocks and endless switchbacks. The trail builders even laid out a couple of carved logs to ride… if you notice them in time. There are gorgeous rhododendron tunnels barely wider than your bars, with some crazy angled jumps sprinkled throughout, including a tombstone slab near the bottom that can launch you or ruin you. If you want to run Uktena at speed, be on your A-game. It’s a hoot, but it can go bad quickly. Want to test your mettle and satisfy that need for speed? 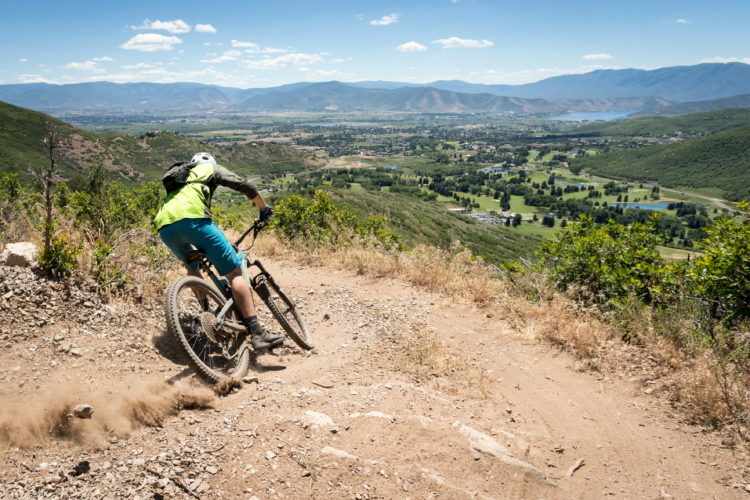 Then hit the Kessel Run, a downhill-only course worthy of its namesake, that offers ridiculously-fast, flowing turns and a family of tabletops that grow as you go, crowned with an epic sky bridge that launches you back onto the trail like a starfighter. The jumps are impressive, and the speed is deceptive. Kessel even has several respectable rock gardens tucked away that appear with little warning. My only complaint is the climbs in the middle and the nasty stack of switchbacks waiting if you run all the way to the end. This always feels like a rude intrusion into my fun, so I usually bail out early onto Lazy Elk, avoid the tail-end climbs, and keep rolling the whole way. Then there’s Spearfinger – she was a giantess of Cherokee lore, with a long stony finger she’d use to stab men through the heart or pull out their livers. 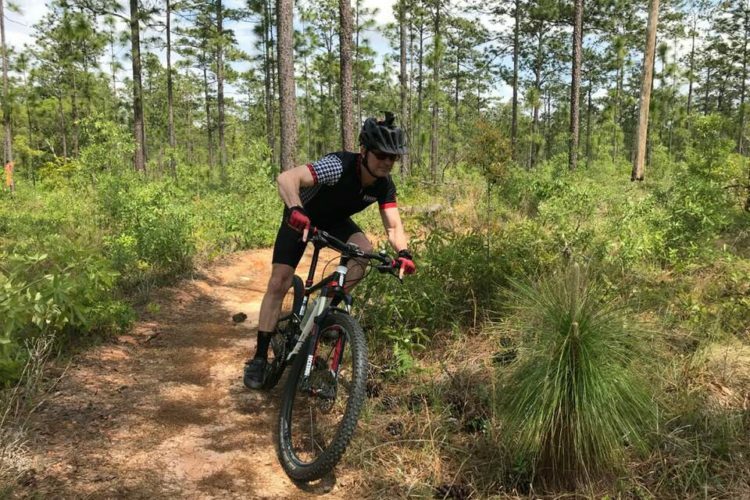 She wouldn’t have had such a bad attitude, though, if she’d had a chance to ride the trail named in her honor. No one can roll through three solid miles of big berms, smooth hops, and unbelievable flow, and still come out surly at the end. 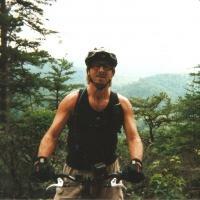 Now, there are trails in WNC that are taller and faster (Kitsuma) and trails that are gnarlier by far (Farlow Gap). But you’d be hard-pressed to find any other piece of trail that holds this much pure joy in it! Zoomy switchbacks that you can roll horizontally. A triple switchback sandwich in one spot that will have even the crankiest, most jaded rider hollering like a kid again. And jump after jump after jump, till you sheepishly have to let a few slip past because your arms and legs are getting too tired. 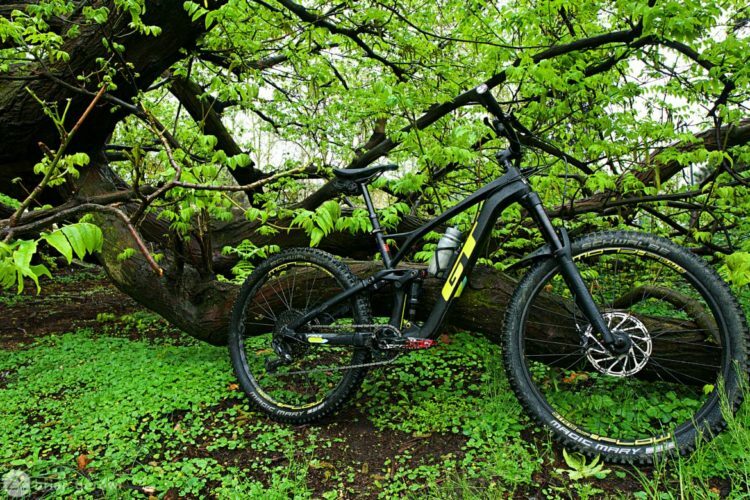 If you’re like me, you started riding bikes in the woods because it’s fun. Well, Spearfinger packs more fun per mile than any other trail I know. Period. 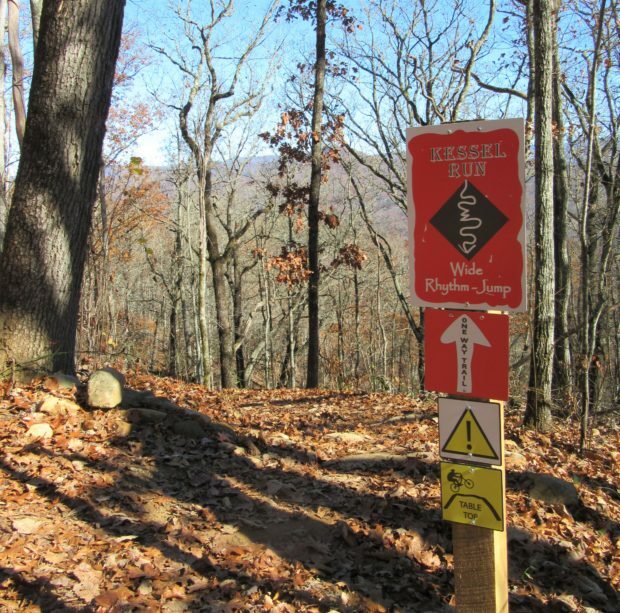 Be forewarned, though: Fire Mountain isn’t some bulldozed pump track. 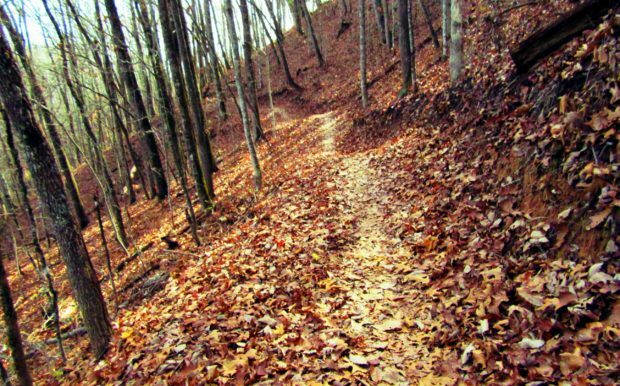 All that cool hopping and fast running happen along twisty Western North Carolina singletrack. That means if you swing a bit too wide after a wall ride you’ll be over the edge, bouncing off some trees for a while. Carry too much speed into a jump, and you may realize in mid-air there’s a switchback in your landing zone. It’ll keep you on your toes, for sure. But the speed, the swooping turns, the bridges, and the magnificent jumps make any potential hazards worth risking. To be honest, the climbs up are no fun. 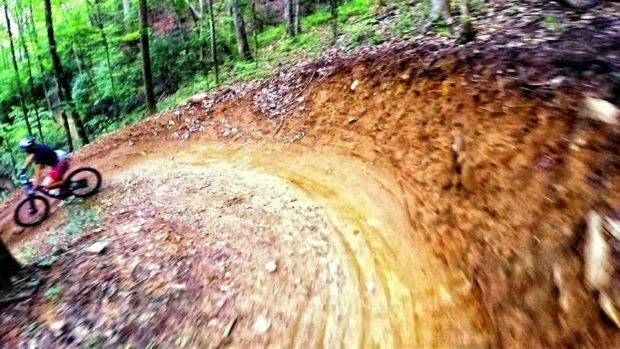 Any track you take is going to dish out 20+ switchbacks. Some you can spin through, and others your only option is to stand and grunt it out. Forget counting them, as it’ll only break your spirit. Though if you spot the Burnt Bear on Uktena, you’re 2/3 of the way through. It’s only three miles or so to the top, so just keep spinning and know that the prize at the end is well-worth the cost of the climb. 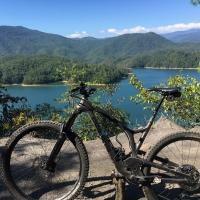 The entire Fire Mountain trail system shows off the evolving skills of the Trail Dynamics team who built it: Ridgeline in Dupont Forest, then Western Carolina University, and now Fire Mountain. Every curve, every berm and high-side, every jump and dip, seem designed to maximize your speed, flow, and adrenaline level. 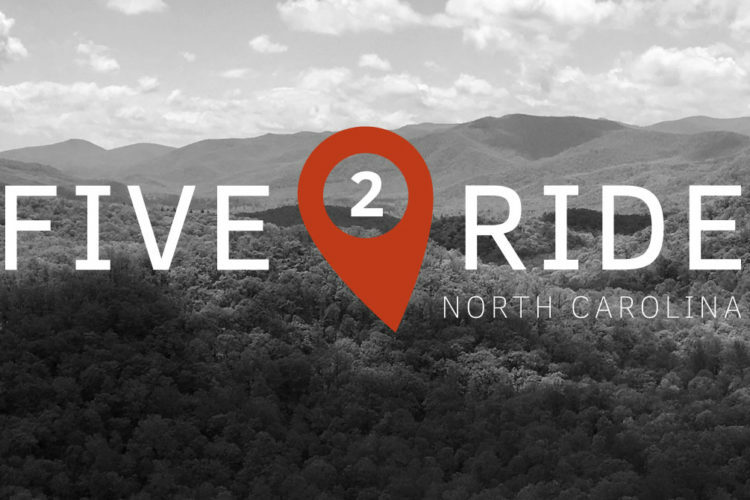 So do yourself a favor: come to Western North Carolina and ride Fire Mountain. You deserve to have this much fun. Sounds great, I can’t wait to ride there! Come up any time Jeff. Trail is only 20 min away. New untried brewpub in town too! 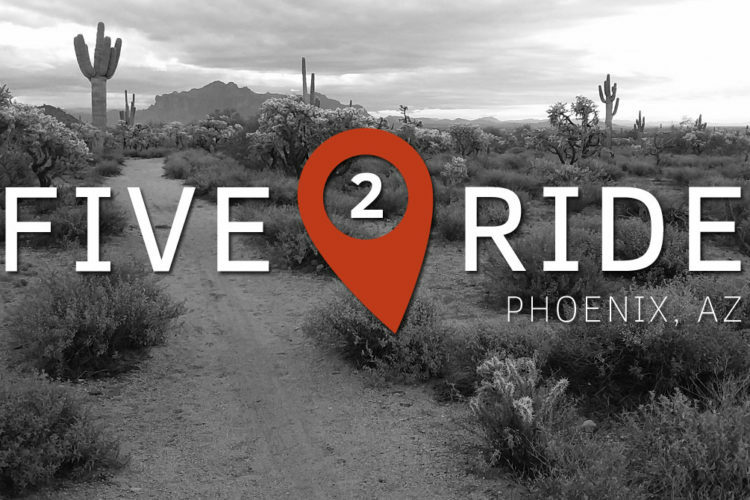 Sounds fantastic… it’s now on the “must ride” list!